Happy Halloween. As an author of Celtic/Paranormal/Romance novels, my favorite holiday is Samhain, the Celtic festival which gives us our Halloween traditions. Samhain, pronounced SOW-uhn, is the Celtic New Year, October 31st or November 1st. Samhain falls between the old year and the new, it is a day without time. Spirits of the dead and supernatural beings easily cross into our earthly dimension on this day, since the veil between worlds is at its thinnest. The ancient Celts put food or treats out for their ancestors and celebrated this day with them. Here are some Samhain excerpts from several of my books. Musicians came forth, strumming a harp and playing the Pict triple pipes. Brude meant to tell her they couldn’t wed this eve, but as he neared her, she seemed more like the woman he longed to lie with again. Between thoughts of Tanwen entwined with him, the roaring bonfire, and the music, he forgot his forebodings. He joined in a dance around the flames. The earth beneath him vibrated to the beat of Lossio’s goatskin drum, the haunting hum of the triple pipes, and the ethereal tone of the harp. He was smoke rising from the fire, and the music pushed him high into the air. Mellow warmth swirled in the pit of his belly. Brude spun faster and faster around the blaze. As he leapt in the dance, he turned his gaze toward Tanwen. With thoughts of the new family she and Brude would soon have, Tanwen fastened her gaze on the feasters scattered across the hall. Here and there, between clusters of people, lay empty animal pelts with plates piled with food in front of them. Places for the spirits of the dead who came through the oak door to feast at Samhain. Her ancestors, all of her family was here at her wedding, and sharing this day with her. Her brother Boudicius, her mother, her father, her aunt, and her grandmother Boudica, who had foreseen this very day. It brought a tear to her eye. After feasting, the tribe climbed up the hill, where the kids played a game with an apple hanging from a stick alongside a lit candle. One by one, amid squeals and giggles, they tried to take a bite of the fruit, while the flaming candle dangled dangerously near. Adults sat with each other, telling funny stories and some serious ones of the events of the past year, encouraging the dead who gathered with them to take interest in the affairs of the living. Others danced around the bonfire, and many couples broke off from the crowd, to find little spaces of privacy here and there, for coupling long into the night. The air was filled with an exuberant din of singing, chattering, and further Samhain merriment. Her child would be born on this day, which fell betwixt the old and new year. A day without time. Malcolm grinned at Bethoc as he carried her through the city streets. "A selkie, a Scot, a Pict, and born on Samhain; this will be a special child." "Aye, but she is only in the Otherworld. You shall see her spirit at Samhain, and in the next life you will all meet again." Mabon bid his friends good eve, and with a slight stagger, walked back to his tent. Lifting the oilskin flap, he crawled inside and rolled onto his cot. Shutting his eyes, he fell into a deep, drunken sleep. Until the words, "The dead walk tonight and it is not even Samhain," sounded in his ear, along with a puff of hot breath. "Lads!" Nesta clapped her hands hard. "The tarts are almost done." "Come, get your face painted for Samhain," Aelfrida called to the boys. Firmly, she cupped the tallest lad's chin in one hand while brushing a chunk of crumbling charcoal across his cheeks. He shut his eyes tight and she blew the excess soot away. She looked at his sooty face and clicked her tongue. "I do not know if you are a spirit of the dead or a dirty-faced lad." He raised his arms and curled his fingers like claws then moaned loud enough to be heard in the otherworld. "Oh!" She laughed. "A spook you are then!" "Paint my face," the youngest lad called as he bobbed up and down. The charcoal felt dry and powdery in her fingers as she sketched the outline of a skeleton on the little urchin face. "You are a true haunt," she declared. She smudged the third lad's face with black charcoal and pronounced, "The spirits are sure to think you one of them and pass you by." She stood back and grinned. They are so cute. Not a one is a terror as they are of a wont to be. "Let me paint your face, Githa," Aelfrida called to the little girl. "Nay." She shook her head and scampered toward the wall. Aelfrida burst out in laughter. A pounding noise sounded at her back followed by creaking and a chill gust of wind. She swiveled to her left. The door was open but no one was there. The children suddenly grew quiet. Their wide eyes fixed upon a spot to her right. Slowly, she turned. "Boo!" Tryffin stood there with a huge grin on his soot-covered face. Aelfrida flung her hands aside her head. "You are a sight." She dropped her shoulders and burst out in giggles. "I am a spirit come to find a live body for Samhain." With a seductive gleam in his eyes he said, "I think I shall take yours." I enjoyed your article, Cornelia, and I love Celtic stuff, so I think your books look awesome! :)Thanks for an interesting read. Please put me in for the Druid Bride drawing. (Do I get to actually be a druid bride for day? ;) j/k) Good luck with Druid Bride, and all you do! And have a blessed/happy Samhain/Halloween! Thank you so much for the comment and the kind words, Julianne and yes draw blue woad designs on your body and put a druid robe on and your a druid bride for a day. I love it. I read alot about Druid Bride and it all was good. Sounds like a very good read. Please enter me into the contest. 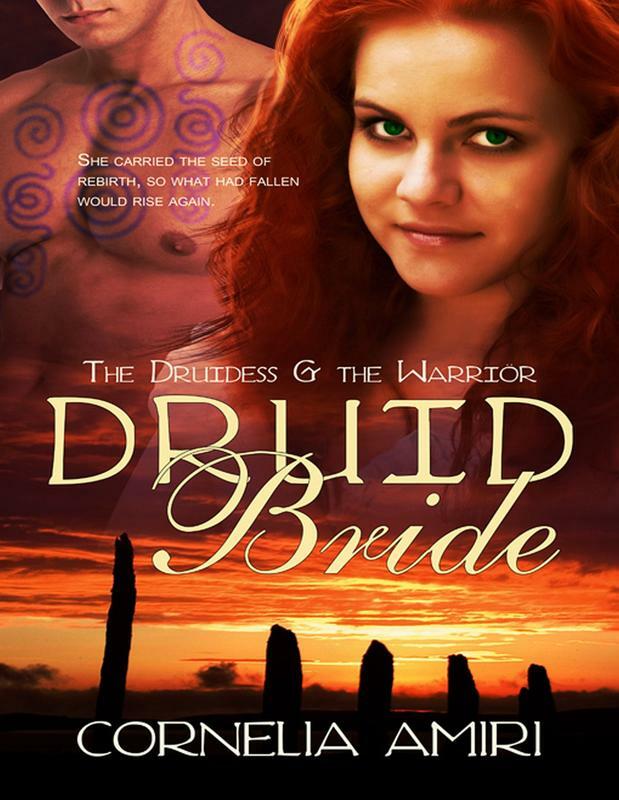 Druid Bride sounds like a great book. And the excerpt from The Fox Prince was perfect for Halloween/Samhain. Cornelia, that sounds like a great idea. ;) I actually did that with blue theatrical makeup, one year for a Halloween costume... Can't find the pictures now though. 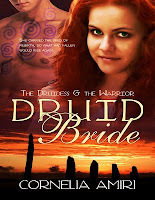 Sorry for the delay in announcing the winner of Druid Bride. Congratulations to Loretta Canton! You'll receive an email regarding your win.